﻿From ﻿beginning ﻿SEM ﻿work ﻿became ﻿not ﻿only ﻿our ﻿major ﻿work ﻿tool, ﻿but ﻿it ﻿is ﻿our ﻿"eye" ﻿to ﻿view ﻿on ﻿these ﻿extremely ﻿tiny ﻿critters. ﻿As ﻿mentioned ﻿above, ﻿light ﻿microscopy ﻿yields ﻿no ﻿results ﻿at ﻿all. ﻿One ﻿can ﻿see ﻿specimens, ﻿which ﻿are ﻿brownish ﻿and ﻿shiny, ﻿but ﻿details ﻿cannot ﻿be ﻿seen. ﻿Therefore, ﻿the ﻿only ﻿method ﻿to ﻿visualize ﻿such ﻿small ﻿material, ﻿i.e. ﻿starting ﻿at ﻿magnifications ﻿at ﻿50 ﻿or ﻿even ﻿100 ﻿times, ﻿rarely ﻿below, ﻿for ﻿overviews ﻿and ﻿from ﻿1,000 ﻿times ﻿to ﻿10,000 ﻿times ﻿magnification ﻿for ﻿details ﻿such ﻿as ﻿the ﻿bristles ﻿and ﻿pores. ﻿At ﻿this ﻿magnification, ﻿the ﻿granular ﻿phosphatic ﻿surface ﻿contrast ﻿and ﻿the ﻿resolution ﻿hinder ﻿nice ﻿views, ﻿but ﻿finest ﻿pores ﻿of ﻿1-2 ﻿µm ﻿or ﻿setulae ﻿of ﻿diameters ﻿below ﻿the ﻿micron ﻿range, ﻿i.e. ﻿between ﻿0.2 ﻿and ﻿0.5 ﻿µm ﻿have ﻿to ﻿be ﻿documented ﻿that ﻿way ﻿– ﻿we ﻿used ﻿larger ﻿lens ﻿opening ﻿and ﻿raised ﻿the ﻿voltage, ﻿when ﻿possibly. ﻿The ﻿normal ﻿voltage ﻿we ﻿used ﻿was ﻿10,000. ﻿Already ﻿the ﻿S4 ﻿Cambridge ﻿SEM ﻿(still ﻿all ﻿valves ﻿to ﻿be ﻿operated ﻿manually) ﻿allowed ﻿to ﻿tilt ﻿and ﻿by ﻿this ﻿to ﻿create ﻿series ﻿of ﻿shots ﻿of ﻿a ﻿specimen ﻿at ﻿different ﻿angles. 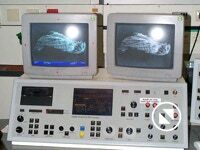 ﻿Combined, ﻿one ﻿could ﻿even ﻿yield ﻿a, ﻿more ﻿or ﻿less, ﻿smoothly ﻿running ﻿movie. ﻿At ﻿the ﻿beginning ﻿the ﻿analogous ﻿camera ﻿allowed ﻿pictures ﻿of ﻿9 ﻿X ﻿9 ﻿cm, ﻿and ﻿each ﻿scan ﻿took ﻿quite ﻿a ﻿long ﻿time ﻿(one ﻿scan ﻿run ﻿over ﻿an ﻿image). 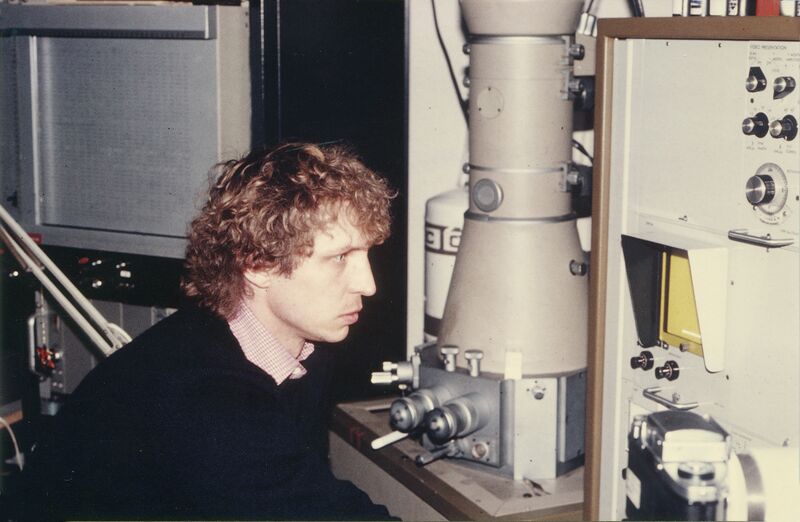 ﻿We ﻿developed ﻿all ﻿images ﻿in ﻿a ﻿lab, ﻿for ﻿which ﻿Georg ﻿Oleschinski ﻿was ﻿responsible. ﻿He ﻿also ﻿made ﻿the ﻿final ﻿pictures ﻿for ﻿our ﻿tables ﻿– ﻿all ﻿handmade. 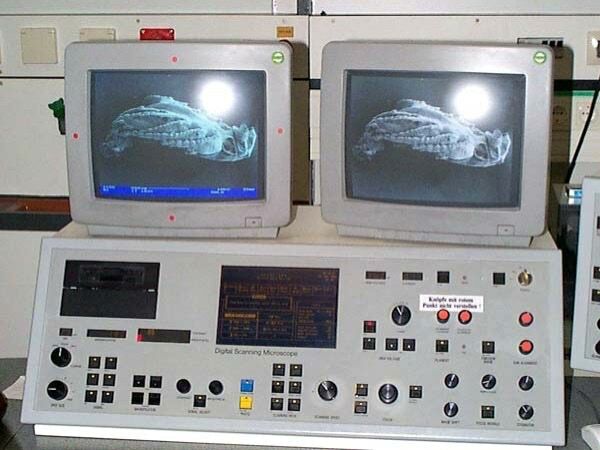 ﻿Later ﻿in ﻿Ulm, ﻿we ﻿used ﻿a ﻿SEM ﻿at ﻿the ﻿Center ﻿of ﻿Electron ﻿Microscopy ﻿of ﻿the ﻿university, ﻿which ﻿had ﻿only ﻿an ﻿extremely ﻿old ﻿apparatus, ﻿but ﻿with ﻿digital ﻿equipment, ﻿so ﻿we ﻿switched ﻿to ﻿digital ﻿images ﻿– ﻿BUT ﻿just ﻿1024 ﻿X ﻿1024 ﻿pixels. ﻿These ﻿had ﻿to ﻿be ﻿transferred ﻿into ﻿a ﻿rectangular ﻿image ﻿to ﻿fit ﻿the ﻿real ﻿size. ﻿Until ﻿Dieter's ﻿retirement ﻿2016 ﻿we ﻿had ﻿to ﻿stick ﻿to ﻿that ﻿old ﻿machine, ﻿because ﻿the ﻿university ﻿did ﻿not ﻿buy ﻿any ﻿newer ﻿apparatus ﻿for ﻿us. ﻿The ﻿only ﻿good ﻿thing: ﻿team ﻿of ﻿the ﻿central ﻿service ﻿unit ﻿built ﻿a ﻿special ﻿tilting ﻿and ﻿rotation ﻿unit ﻿for ﻿us, ﻿which ﻿permits ﻿tilting ﻿of ﻿90 ﻿degrees. ﻿At ﻿least ﻿that ﻿helped ﻿much, ﻿particularly ﻿when ﻿re-scanning ﻿old ﻿specimens ﻿of ﻿which ﻿we ﻿have ﻿only ﻿overviews. ﻿Yet ﻿this ﻿SEM ﻿was ﻿extremely ﻿slow ﻿and ﻿we ﻿could ﻿not ﻿take ﻿as ﻿many ﻿photographs ﻿as ﻿we ﻿wished. ﻿Indeed ﻿time ﻿ran ﻿out ﻿to ﻿document ﻿all ﻿the ﻿material ﻿Klaus ﻿had ﻿left ﻿us: ﻿Each ﻿year ﻿we ﻿had ﻿to ﻿realize ﻿that ﻿more ﻿specimens ﻿were ﻿destroyed, ﻿either ﻿single ﻿ones ﻿cracked ﻿and ﻿flipped ﻿off ﻿the ﻿stubs, ﻿or ﻿the ﻿entire ﻿SEM ﻿stub ﻿was ﻿destroyed ﻿– ﻿then ﻿with ﻿10-20 ﻿specimens ﻿on ﻿it, ﻿some ﻿specimens ﻿figured ﻿in ﻿publications ﻿or ﻿even ﻿type ﻿specimens ﻿on ﻿it. ﻿Big ﻿Loss, ﻿which ﻿affected ﻿also ﻿various ﻿beautiful ﻿specimens ﻿of ﻿Rehbachiella, ﻿Skara ﻿or ﻿Dala. 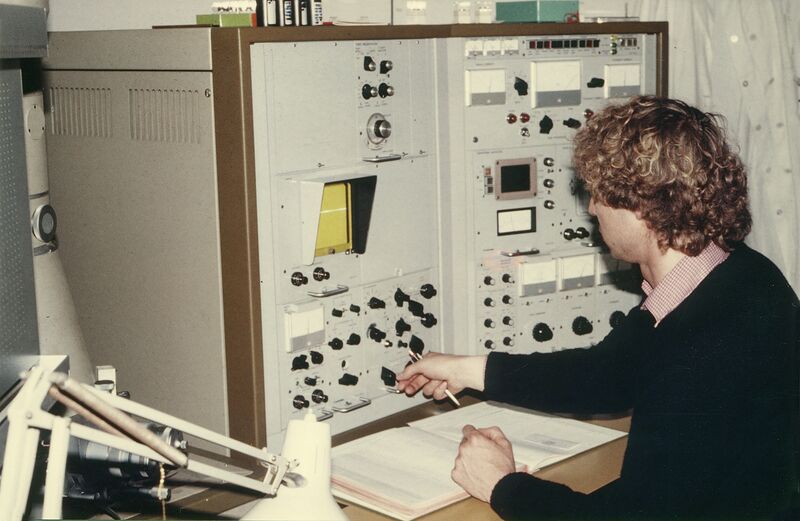 ﻿After ﻿Dieter's ﻿retirement, ﻿he ﻿transferred ﻿the ﻿material, ﻿borrowed ﻿from ﻿the ﻿Steinmann ﻿Institute, ﻿University ﻿of ﻿Bonn ﻿(the ﻿real ﻿owner, ﻿not ﻿Klaus) ﻿to ﻿the ﻿University ﻿of ﻿Lund. ﻿His ﻿hope ﻿is ﻿that ﻿at ﻿some ﻿stage ﻿more ﻿of ﻿the ﻿material ﻿can ﻿be ﻿documented ﻿there. ﻿Yet ﻿no ﻿one ﻿is ﻿in ﻿sight ﻿for ﻿this ﻿job, ﻿and ﻿also ﻿not ﻿to ﻿continue ﻿working ﻿up ﻿the ﻿huge ﻿rest ﻿remaining ﻿in ﻿the ﻿collection.